The 50,000-member union wants to work with robots, not be replaced by them. Each day, Vegas hotels and restaurants dish up 60,000 pounds of food. It takes nearly 50,000 real-live humans to prepare and serve all those crab legs, potatoes, and chocolate cakes, and now they’ve made it clear: they don’t want to lose their job to robots. The servers and chefs are likely concerned because they’re seeing cooking technology creep into other kitchens. Autonomous cooks make a spectacle outside of Vegas: Meal stations cook and plate meals at Boston’s Spyce, and CafeX in San Francisco uses a single robotic arm to whip up lattes and cappuccinos. Some larger mechanisms, like Momentum Machine’s burger chef, work on the scale that Vegas needs — the robot reportedly pumps out 400 custom burgers an hour. The Pew Research Center predicts more automation will work its way onto the food scene by 2025, and several of the center’s tech experts anticipate that food service employees will have to adapt the most. 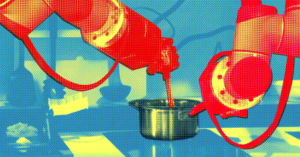 For now, though, food service robots that can take over human jobs aren’t commonplace. In fact, the food industry has employed other technologies, like apps that take orders, that have created more jobs in food service. A report released last September by Restaurant Opportunities Center United, another food service union, noted that in California, increased automation has let restaurants beef up the number of cooks. At Starbucks, digital ordering platforms increased sales, and the company hired more baristas to handle the surge. That’s what pushed McDonalds to put more cooks behind the counter, too. This, for now, is symbiotic — it relegates some of the more menial tasks to technology, and allows humans to do what they do best: “the human touch—the presentation, the personalization, the handing it to you with a smile,” as Kale Rogers, the COO of Spyce, told Civil Eats. This combo — automation that provides more jobs while amplifying human strengths — is what the Las Vegas union is pushing for. “We support innovations that improve jobs, but we oppose automation when it only destroys jobs. Our industry must innovate without losing the human touch,” says Geoconda Argüello-Kline, the union’s secretary-treasurer, in their press release. It’s a good idea for food service workers to push employers in the right direction before automation is more commonplace. Tech may put more cooks in the kitchen for now, but as technology improves to compete with the humans at the things they do best, that won’t last. And if other cooking unions don’t negotiate their space soon, who knows who — or what — will be serving up shrimp cocktail around the country.